These just in! Maysey Craddock received two rave reviews of the show A Different Kind of Landscape at the Memphis Brooks Museum of Art (with Erin Harmon thru November 10). In the Memphis Flyer writer Eileen Townsend expands on Maysey's "psyche of the border." Townsend writes: "Craddock's imagined border may be the border of a kudzu-draped river bluff or the metaphoric border between the past and present. Perhaps the most intriguing border in her work, though, is that between the negative and the full scene, the undeveloped and the fully shown. Craddock's concerned with the liminal space behind the image - the memory behind the place." In the Commercial Appeal, Fredric Koeppel comments on the exhibition as "a rare beauty." 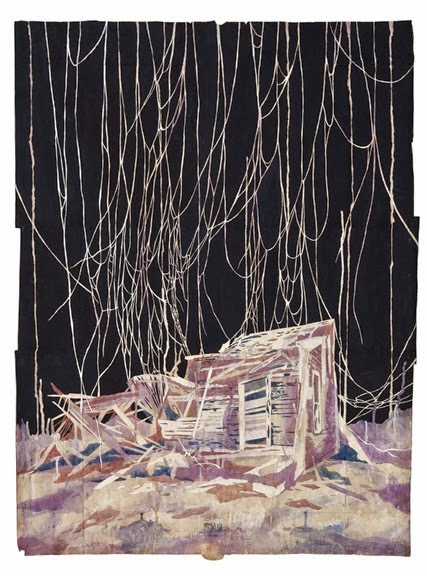 Koeppel writes: "Craddock still treads along the edges of this [ruin] motif but with growing maturity, insight and detachment, offering a more generalized view of the human condition through these utterly stylized and fairly drastic visions of twisted and tangled roots and branches and rural dwellings. In fact, among the most intense of Craddock's pieces in this exhibition are a pair of small recent paintings - "the shadow of lost trees" and "maritime" - that come close to abstraction while expressing a deep and contradictory sense of rootedness and isolation." Click here to read the Flyer review. Click here to read the Commercial Appeal review. And, Maysey has another museum exhibit, Angle of Repose, up at the Baum Gallery at the University of Central Arkansas in Conway (through October 27). That show travels to the Staniar Gallery at Washington & Lee University in Lexington, Virginia.